A sentence is a group of written words expressing a statement, question, command, or exclamation that always begins with a capital letter and must end with an appropriate punctuation mark. A sentence’s purpose is to provide or request information. Use the activities below to introduce or extend sentence building to your students. 1. Flash Cards – Cut a number of note cards in half. Take several cards and write familiar nouns (red) on them with a colored marker or crayon – Dad, Fido, Jeff, Grandma, Becky, etc. Then write verbs (blue) on some others – drives, jumps, plays, bakes, etc. Finally, write a period (. ), question mark (? ), and exclamation mark (!) in black on some other cards. Have the student choose a noun (red), verb (blue), and an end mark (black) and make sentences. 2. Add in articles (a, an, the) and more nouns (cookies, piano, ball, car, pizza) in different colors and repeat the exercise. Dad drives a car . Grandma bakes the cookies ! Fido chases the ball ! Becky plays a piano . 3. When the student experiences success with the basics of #1 and #2, create a template like the one below using an 8 ½” x 11” piece of paper cut in half lengthwise. Divide the paper into the number of columns representing only the parts of speech the student is familiar with like the card below. This example is an advanced card. The student chooses words in order from each column and creates a sentence. The conjunctions on the end of the template allow the student to add another thought or phrase to the sentence. For example: The stray cat meowed loudly but walked softly. The new telephone rang loudly, and the tall mailman ran. The young woman and child walked slowly. Create several templates for practice. Eventually add another column for prepositional phrases/dependent clauses like on the sidewalk, behind the house, up the stairs, last week, at the end of the day. 4. 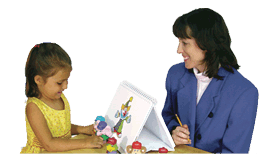 Sentence Templates – Use pictures from a coloring book or a drawing. Label different parts of speech throughout the picture. With a pencil, have the student draw a line from an article to a noun and connect the words that make sentences (similar to a maze game). 5. Write several sentences on paper leaving a blank(s) for nouns, verbs, articles, etc. Make more cards like the ones in Activity #1. Present three word cards for the student to choose a word that fits in the blank. Have the student read the sentence using the word he/she chose. 6. Word Magnets – Purchase a set of word magnets or make some word magnets using a dry-erase magnetic strip roll. Separate the words and mix them up. Have the student arrange the words and punctuation marks into sentences on a magnetic board. 7. On a sheet of paper, scramble the words of a complete sentence using the parts of speech the student is familiar with. Have him/her unscramble the words and write the sentence correctly on a separate sheet of paper. See if the student can scramble the sentence again using a different word order. For example, “The children played quietly in the tree house./In the tree house, the children played quietly./Quietly in the tree house, the children played./In the tree house, quietly the children played.” This is an important exercise in teaching that word order is important in constructing a good sentence. Students can usually “hear” whether or not a sentence has correct word order.